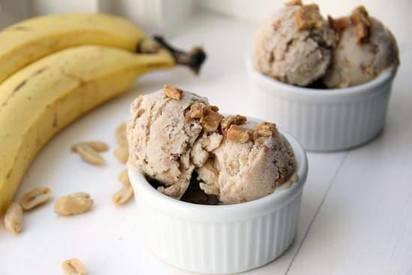 Chunky Elvis Ice Cream recipe – homemade ice cream with peanut butter, bananas, honey, and Bacon! I’m sure you’re all familiar with the Elvis sandwich which contained peanut butter, bananas, fried Bacon, and sometimes honey. This ice cream contains a roasted honey banana flavored ice cream with chunks of peanut butter candy coated Bacon! Sounds crazy I know, but it was actually really good! If you’re a little nervous about the Bacon, it doesn’t have a HUGE Bacon flavor. It’s more of a subtle saltiness. If you WANT more of a Bacon flavor, you may want to add more Bacon. (Of course we want more Bacon flavor!) This is not for the faint of heart, but definitely a show stopper if you’re looking for something fun and kind of whimsical! RIP to the King, Elvis Presley!